BERNARD GOLDBACH in Mullingar, Ireland | 268 Words Image from US Census. FROM WHERE I SIT, I know that Irish higher education costs will continue rising, both for taxpayers and for students. In the USA, higher education costs have outstripped the rest of the economy's cost structure. There is no real competitive pressure in the higher education in Ireland. Instead, Ireland Inc banks part of its reputation on the steady production of highly-educated graduates available at the beck and call of multinationals. But there's another dimension of higher education and that's the relative increase when compared to other sectors of the economy. During the life of the current Irish government, the cost of third level student fees will increase (to EUR 5000 annually according to one planning document). When that happens, I expect a robust student loan structure to roll into place, helping banks to plug some holes in their loan books. As Americans will tell you, student loans are a real growth industry. And as those trapped inside the cycle will explain, it's called debt-serfdom--a plight worse than negative equity in property. 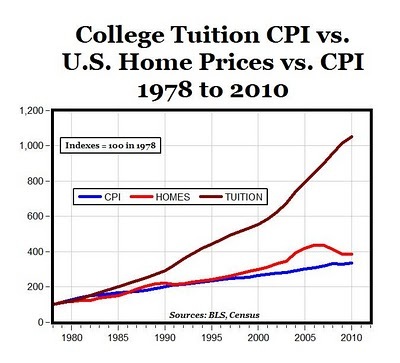 Debt serfdom sneaks up on starry-eyed students, easily ballooning to levels above $100,000 for individual students. I hope Ireland can avoid this new form of servitude but with international banking gurus now effectively running Irish fiscal policy, I think the die have been cast. I am placing a long bet: Irish third level students will pay EUR 5000 to register for classes in August 2017.